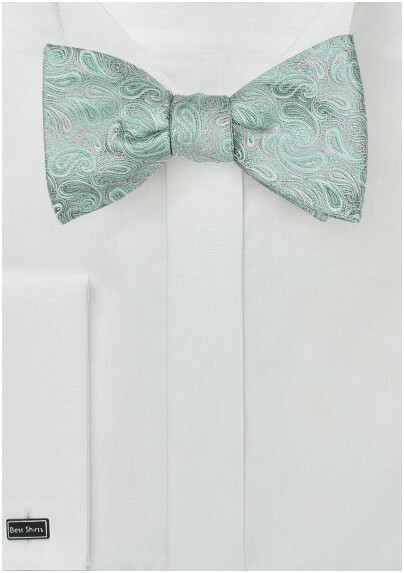 When you want to make a statement, try this soft mint and light silver paisley bow tie, a swirling mixture of colors that is sure to impress. 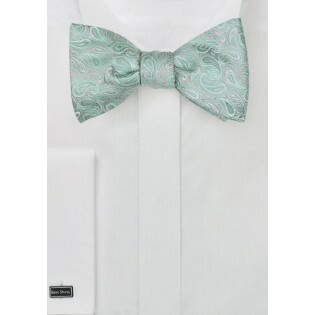 Perfect for weddings in the summertime, this bow tie will look great with light colored suits as well as navy. This is a self-tie bow tie made from 100% silk. It adjusts with a clip in the back, and can fit up to a 19.5 inch neck. The bow tie itself is 4.5 inches wide and 2.5 inches tall on the wings.